We first visited Yamato before our opening when we decided on buying a noodle-making machine. We tasted the noodles made by a specially assigned staff member, and they were Marvelous! However, when upon getting back to Hong Kong we tried to replicate that taste on our own machine, things did not work out the way we expected. So, we went back to Yamato, checked our process, and indeed found a reason the noodles we were making did not come as good as the ones we tried at Yamato. In hindsight, what was really good about our decision to choose Yamato's machine (hardware) was the 'software' assistance we received alongside - and here we are talking not only about how to produce noodles of good quality, but about such things as noodle food service industry know-hows and management acumen. You'd think that aside from technical warranty liabilities, the seller would no longer feel any attachment nor responsibility to the customer once the equipment was shipped and delivered, but Yamato did really help us out a lot with information and knowledge - which are so important when you do business abroad. To think of it, software must be inherently more valuable, and thus expensive, but in this regard Yamato was generous beyond limits. And we really appreciate that. Truth to be said, customers in Hong Kong are becoming more and more acquainted with how authentic Japanese udon is supposed to taste, so we absolutely are in no position to compromise on that issue. 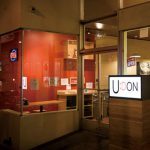 We are fully committed to serving the REAL UDON and ONLY REAL UDON, and the fact that our udon shop outperforms sales-wise all others within our group of companies shows that our customers are aware of it and value it.